So you’ve thought about taking dance lessons, called a studio and are getting ready for your first lesson. You are fully prepared to be challenged by learning some cool new moves. What you weren’t expecting is how the studio has such a fun social atmosphere. With groups and parties you can really get out of the Work and then Home routine. On your private lesson you feel your heart rate increasing, calories being burned and your confidence improving once you realize you’ve got the hang of this Foxtrot thing! Before you know it 20 minutes is up and your mind and body are already craving more! Studies have shown that when engaging in ballroom dancing, physically you can begin to prevent Osteoporosis, Alzheimer’s, and many other deteriorating diseases. It has also been shown that dancing can wholly improve our mood by releasing the feel good hormone, Dopamine, into our bodies while pumping more oxygen into our bloodstreams! Dancing has the awesome power to teach core skills such as cooperation, communication and understanding. 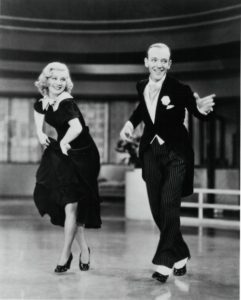 Top Dancers of the 1940’s! Do I need Dance Shoes?! Why it’s important to Dance!